A project by Carol Zentgraf for the Creative Home Arts Club uses fabrics from my first line, Modern Flora. Get the instructions for making this bookshelf cover right here. (The bottom of the article shows more photos and figures mentioned in the directions.) I'm not one for putting skirts on things, including on myself, but I can see how this would be useful if you need to hide a lot of unsightly junk or perhaps small children. 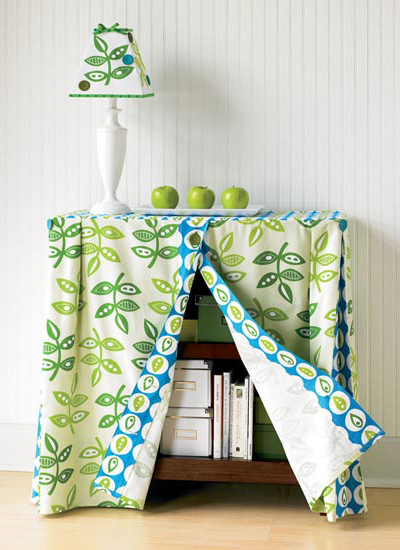 gorgeous fabric puts new life into table/sink skirts! Nice! I love the leaves. Covers like that are great for classrooms, especially preschool-kindergarten. I like the lampshade, myself! I love that lampshade in your fabric too! Not very many people commented on this one?? I like it, but have animals that would adore to play with it and rip it to shreds. Plus I could never make it. So over all, not very convienent. I love this idea. Especially sice you can make the color compliment your decor. Wonderful idea and I really love that blue green fabric!! Love this idea... I currently have a white bed sheet covering my book shelves to keep little fingers out of them. I am going to have to add this to my to do list. I may have to make one of these. Jenna, my 9 yr-old, has trouble keeping her bookshelf neat, and seeing it messy makes me crazy. This looks like the perfect answer- of course, hers will have to be pink and purple! I desperately need to make some of these.. my wee boy has just attained mobility and has discovered the joys of gravity. ...do you think it would work in chain mail?